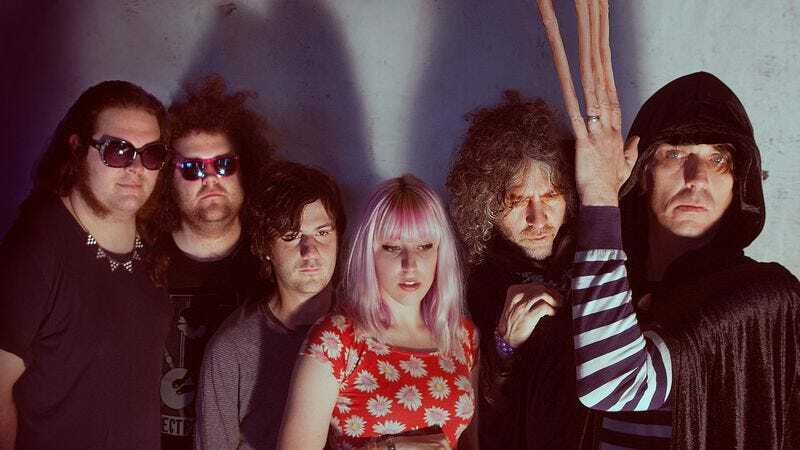 It’s been a weird ride for Wayne Coyne since The Flaming Lips released its magnificent 2002 record, Yoshimi Battles The Pink Robots. Since then, the restless frontman has, along with his band, released a back-to-front cover of Pink Floyd’s Dark Side Of The Moon, collaborated with Chris Martin and Kesha, all while delving into more psychedelic, abstract sonic territory; and that’s all without mentioning that he’s set to release a Beatles cover album with Miley Cyrus this fall. Now Coyne has teamed up with fellow Flaming Lips band member Steven Drozd—Coyne on bass, Drozd on guitar and vocals—and experimental psych band Linear Downfall for a side project by the name of Electric Würms. While the group’s debut EP isn’t nearly as weird as its title—Musik, Die Schwer Zu Twerk, which roughly translates to “Music that’s hard to twerk to”—it boasts all the indulgence that’s made The Flaming Lips’ most recent releases so laborious. “The Bat” is a slowburn reminiscent of Floyd’s “Careful With That Axe, Eugene,” except where that track builds to a palpable cathartic scream, “The Bat” simply lumbers along with all the urgency of Jason Voorhees. “Futuristic Hallucination” is even more languid, panning synths and distant keys resembling orca mating calls swirling alongside slight percussion. Is this jazz? Psych rock? Some sort of amalgamation? It’s possible the members of Electric Würms don’t even know. Such recklessness can be ambitious and invigorating, but on this record it’s strictly listless—drawn-out jams that only accentuate the lack of fresh ideas at the record’s core. “Living” may be the most monotonous track, with a looped drum machine and scattered guitar and synth lines wandering in and out of the arrangement for an unbearable seven-and-a-half minutes. “Transform!! !” briefly injects some life into the EP, a funky bass line anchoring Drozd’s shrieking vocals—it’s the one song that needs to be longer, the melodic center begging for an unhinged freakout to serve as a climax. “Heart Of The Sunrise,” a cover of the mammoth Yes track from 1971’s Fragile, achieves a similar effect, trimming down the original 11-minute jam to a concise four minutes, emphasizing the song’s more pop-leaning elements; the echoing chorus is the most gorgeous and memorable moment on the record. “Transform!! !” and “Heart Of The Sunrise” are exceptions that prove the rule, though. Ultimately, Musik, Die Schwer Zu Twerk is satisfied with halfheartedly rehashing a handful of psych and prog rock signifiers with little renewed enthusiasm or inventiveness.